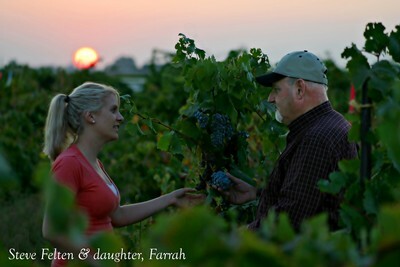 With roots in Germany, Russia and later the Dakotas, the family settled in Lodi, first producing watermelons. Recognizing that the soil and climate were ideal for growing grapes, they began to plant varieties that included Zinfandel, Tokay, Carignane, and Alicante. For over one hundred years, the family has cultivated the land with the aim of producing top quality fruit. Zinfandel was one of the first grape varieties to be planted in the Lodi appellation, although it had also been established in other parts of California. Grapes were originally packed in boxes for shipment to the East Coast and Canada for the purpose of home winemaking. In the early days of production, nearly all of the Zinfandel grapes were shipped with the exception of grapes that were used for making wine at home. By the mid 1930’s, grapes were sold primarily to cooperatives and larger, private wineries with a small portion of the production shipped east. Historically, the vineyards were irrigated by flood or ditch irrigation and the inability to regulate the amount of water applied resulted in larger yields of marginal quality. In the late 1980’s, drip irrigation was introduced, providing the ability to control the amount of water applied to each vine. This resulted in the ability to control the vigor of the vine, healthier fruit and ultimately, lower yields. With the introduction of more sophisticated vineyard practices, including shoot thinning, leaf pulling, color thinning and the removal of a second crop, the ability to produce the grapes of exceptional quality was realized. Part of the extended Felten Family includes their winemaker, Barry Gnekow, who is responsible for crafting the wines from the inaugural vintage. Barry, a Davis graduate with over 25 years of experience of winemaking, has a unique ability to bring the best of the vineyard into the cellar, year after year, producing wines of distinction for Klinker Brick. Another extended family member is Lynne Whyte Barnard, the President of Klinker Brick Winery. Lynne has brought a wealth of entrepreneurial experience to the winery, having owned her own wholesale company and directing sales and marketing for prestigious wine producers in California. She was instrumental in the development of the Old Ghost wine, label design and has been responsible for selling all of the vintages produced to date, developing national and international distribution.